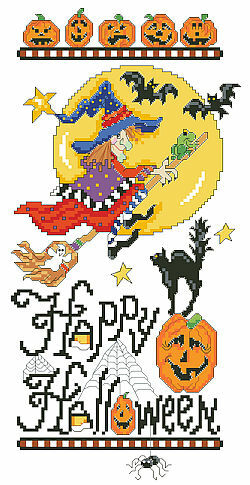 Happy Halloween says it all in this fun and funky vertical sampler by designer Linda Gillum. Witches, bats, jack ‘o’ lanterns and a full moon fill this spooky scene. This cheerful design will delight and brighten your home every autumn as Halloween approaches.